Whether you coach first-time participants at the community sport level or national team athletes, proper nutrition is essential for overall good health and optimal athletic performance. Participants of all ages and at all levels of competition are affected by good nutrition. It’s not only about knowing what to eat -- it's also knowing when to eat, especially if you’re on the road with your athletes, or even with other coaches or parents. Plan ahead to maintain good eating habits by browsing our nutrition tips, and/or contacting a registered SNAC dietitian in your area that can answer your specific nutrition questions! 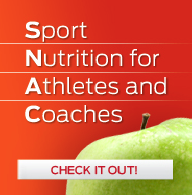 To read more about proper Sport Nutrition for Athletes and Coaches, click here. For more information on the training and evaluation, click here. These concussion awareness resources have been developed as part of the Public Health Agency of Canada’s “Active & Safe” initiative and are designed to help you gain the knowledge and skills required to ensure the safety of your athletes. Get concussion smart via our award-winning “Making Head Way” eLearning modules, test your concussion IQ, find out what happens during a concussion, or simply browse through real concussion stories. For more information on the eModule and concussion guidelines, click here. It’s also not important at first to know every technical aspect of the sport you choose to coach – far more important is the passion and enthusiasm you bring to the role. For further information about how to get started, click here. These FREE tutorials will help you Get Coaching!